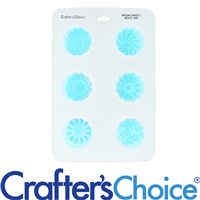 Our Moon Cakes Silicone Mold was designed with the trend of "moon cakes" bath fizzies in mind! Create 6 different floral shaped moon cakes or bars of soap that will pop right out of the mold! Bar Depth: 1.5" Bar Length: 1.75"
Create 6 moon cake shapes, each with a unique design, using the Moon Cakes Square Silicone Mold. 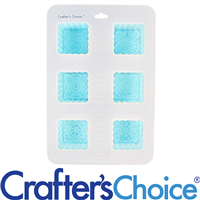 This trendy mold can be used to make soap, lotion bars and bath bombs! Bar Cavities: 6 Bar Depth: 1.5"
Bar Length: 1.75" Bar Width: 1.75"